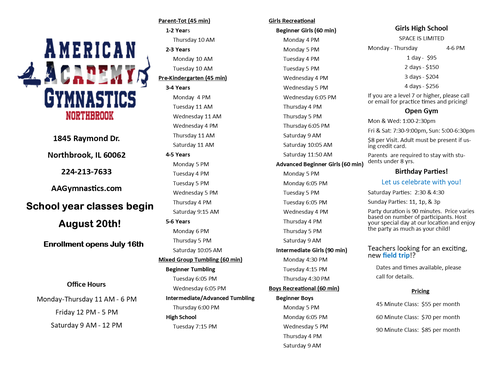 The American Academy of Gymnastics, Northbrook - Updated Schedule! 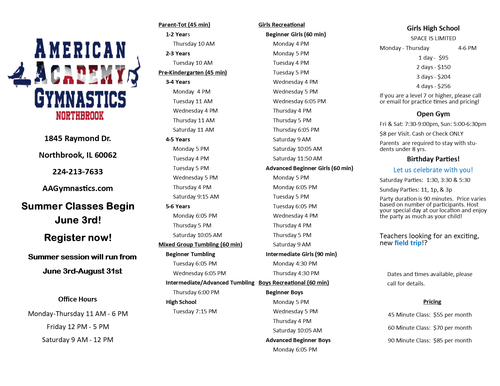 Summer schedule is below the school year schedule, both are currently open for enrollment. *Class dates and times are subject to change and availability. Registration for these programs is open! Call or email to register! Families with 2 or more students receive a 20% discount for the second child, 30% for the third and 40% for the fourth! A child enrolled in more than one class will receive a 20% discount on any additional classes after the first. If you cannot make it to a class, please let us know in advance and we will help you schedule a Make-up. Please no more than one Make-up per month! If classes are full or we cannot find a time that fits your schedule, a ONE FREE Open Gym pass or a 15% OFF Birthday Party pass will be offered. Prices are based on 4 classes per month. If less than 4 classes occur, monthly fee will be pro-rated. Our classes run on a year round basis, and payments are made monthly. All participants must have a credit card on file to enroll in classes. All payments are due on the first of the month, and charges will be made automatically. Registrations taken in the middle of a month will be prorated to reflect classes missed. There is an annual registration fee of $26 per student. This fee is non-refundable. If for any reason you decide to take a break from attending class, please let us know the week before the new month begins and we will drop your child from class. Refunds will only be given for injuries with a doctor's note. We'd love to hear from you! Fill out the form below to get started with your enrollment and we'll give you a call to verify your information!